His Doctrine of the Attributes of God. Future Condition of Pious and Wicked. The name by which a Syrian homilist of the fourth century was known. His homilies, written between the years 337 and 345, are valuable to the Jewish historian; for it may be confidently asserted that no church father was ever so strongly influenced by rabbinical Judaism as this defender of Christianity against the Jews. Georgios, bishop of the Arabs (about 780), notes Aphraates' dependence upon Jewish doctrine (see his letter about Aphraates in Wright, "TheHomilies of Aphraates," v. 36). Wellhausen has noted "how completely the Syriac Church was bound to Jewish tradition, even in the fourth century," and has pointed out that this "is shown strikingly by the 'Homilies of Aphraates'" (Bleek, "Einleitung in das Alte Testament," 4th ed., 1878). Funk and Ginzberg ("Die Haggada bei den Kirchenvätern," i. 1, 76, Amsterdam, 1899, and in "Monatsschrift," pp. 64, 119, 153, 155, 158, 221, 228) both show many parallel passages from Rabbinical literature with which the Scriptural explanations of Aphraates coincide. In certain very important questions concerning the soul, God, retribution, etc., he shows himself a docile pupil of the Jews. His doctrine of the two attributes of God —justice and mercy —is decidedly Jewish (see hom. vi. 6, 114, and other passages); it is often encountered in Rabbinical literature under the familiar designations of "Middat ha-Din" and "Middat ha-Raḥamim"; its oldest rabbinical source is Sifre to Deut. (ed. Friedmann), § 27, p. 71; and it is also found in Philo, as Siegfried ("Philo," p. 213) has shown. Aphraates, in agreement with the rabbis, declares that God's mercy is for men living; while His justice is administered after their death. He holds also that divine justice—the activity of the Middat ha-Din—does not begin immediately after death, but only on the day of judgment. 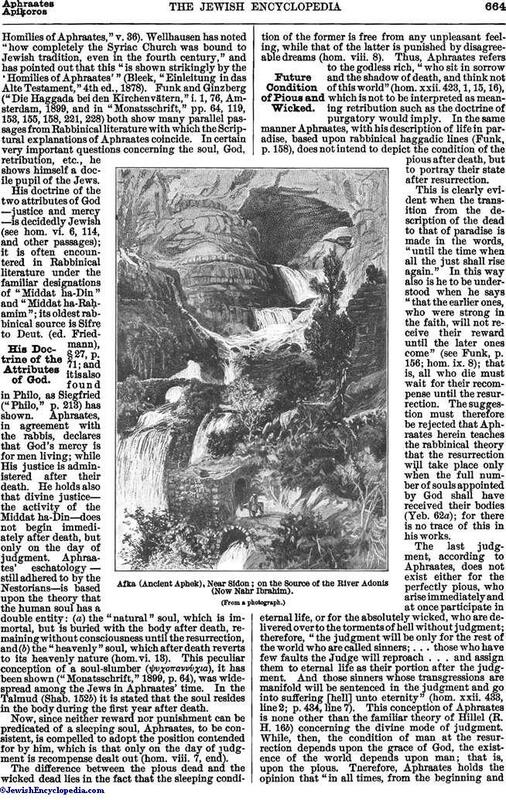 Aphraates' eschatology—still adhered to by the Nestorians—is based upon the theory that the human soul has a double entity: (a) the "natural" soul, which is immortal, but is buried with the body after death, remaining without consciousness until the resurrection, and (b) the "heavenly" soul, which after death reverts to its heavenly nature (hom. vi. 13). This peculiar conception of a soul-slumber (Ψυχōπαυύχια), it has been shown ("Monatsschrift," 1899, p. 64), was widespread among the Jews in Aphraates' time. In the Talmud (Shab. 152b) it is stated that the soul resides in the body during the first year after death. Now, since neither reward nor punishment can be predicated of a sleeping soul, Aphraates, to be consistent, is compelled to adopt the position contended for by him, which is that only on the day of judgment is recompense dealt out (hom. viii. 7, end). The difference between the pious dead and the wicked dead lies in the fact that the sleeping condition of the former is free from any unpleasant feeling, while that of the latter is punished by disagreeable dreams (hom. viii. 8). Thus, Aphraates refers to the godless rich, "who sit in sorrow and the shadow of death, and think not of this world" (hom. xxii. 423, 1, 15, 16), which is not to be interpreted as meaning retribution such as the doctrine of purgatory would imply. In the same manner Aphraates, with his description of life in paradise, based upon rabbinical haggadic lines (Funk, p. 158), does not intend to depict the condition of the pious after death, but to portray their state after resurrection. This is clearly evident when the transition from the description of the dead to that of paradise is made in the words, "until the time when all the just shall rise again." In this way also is he to be understood when he says "that the earlier ones, who were strong in the faith, will not receive their reward until the later ones come" (see Funk, p. 156; hom. ix. 8); that is, all who die must wait for their recompense until the resurrection. The suggestion must therefore be rejected that Aphraates herein teaches the rabbinical theory that the resurrection will take place only when the full number of souls appointed by God shall have received their bodies (Yeb. 62a); for there is no trace of this in his works. 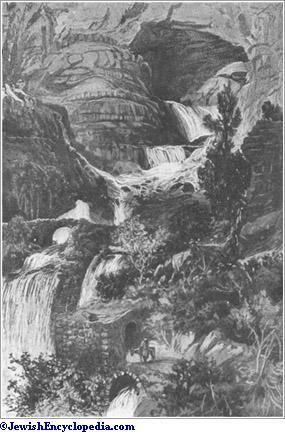 Afka (Ancient Aphek), Near Sidon; on the Source of the River Adonis (Now Nahr Ibrahim). The last judgment, according to Aphraates, does not exist either for the perfectly pious, who arise immediately and at once participate in eternal life, or for the absolutely wicked, who are delivered over to the torments of hell without judgment; therefore, "the judgment will be only for the rest of the world who are called sinners; . . . those who have few faults the Judge will reproach . . . and assign them to eternal life as their portion after the judgment. And those sinners whose transgressions are manifold will be sentenced in the judgment and go into suffering [hell] unto eternity" (hom. xxii. 433, line 2; p. 434, line 7). This conception of Aphraates is none other than the familiar theory of Hillel (R. H. 16b) concerning the divine mode of judgment. While, then, the condition of man at the resurrection depends upon the grace of God, the existence of the world depends upon man; that is, upon the pious. Therefore, Aphraates holds the opinion that "in all times, from the beginning andunto eternity, there will be pious and upright men on earth."Hom. xxiii. 455. Aphraates quotes in proof a Biblical verse which does not exist in our Bible. The quotation, p. 461, of which neither Wright nor Bert could find the source, is Psalm lxxxix. 2: "The world is built upon mercy" (A. V. "Mercy shall be built up forever"). This is also of rabbinical origin; for the rabbis teach that the world's existence depends upon the presence of the pious in it; the only disagreement is in the necessary number of these "pillars of the universe. "See Suk. 46b, where the number is placed at 36; but in Yoma, 38b, one is held sufficient. See "Monatsschrift," l.c., p. 546, and the passages quoted from Diogenes and Justin Martyr.A fixed period is set for the world: "For the world will exist for 6,000 years, like to the six days of the Lord, and then the Sabbath of God will begin" (hom. ii. 13, p. 36, line 5). This millennarianism is, however, not to be ascribed to rabbinical influence upon Aphraates; for it belongs to the oldest elements of Christianity, taken over from Judaism; indeed, Aphraates refers to "the tradition of our sages." This is mentioned because it is characteristic of the whole method of Aphraates, who herein also teaches consonantly with the rabbis (compare Sanh. 97a). The knowledge of Aphraates' personal relations with Jews is limited to what may be learned from his writings. For instance, he maintains that the homily "Upon Persecution" (hom. xxi.) owes its existence to the arguments against Christianity made to him by a Jewish sage (the epithet "ḥak-kima" here is not a title, like the old "ḥakam," but "sage" in general). His frequent vigorous attacks on Jewish sages and disputants also show that, in spite of the great influence that the rabbinical teachings exercised over him, he entered the lists against his teachers more than once. One-half of this collection of homilies is an avowed defense of Christianity against Judaism; and his characteristic principle is that attack is the best defense. Therefore, he in veighs (homs. xi., xii., xiii., xv.) against circumcision, Passover, the Sabbath, and dietary laws, the chief portions of the Jewish ceremonial law, in order to proceed to the rejection of the doctrine of the "chosen people" (hom. xvi.). In his apologetics for Christianity, next to the defense of the designation "Son of God" for Jesus (hom. xvii. ), it is celibacy that he mainly upholds against Jews and heathen (hom. xviii.). In hom. xix. he disproves the Messianic hopes of the Jews. 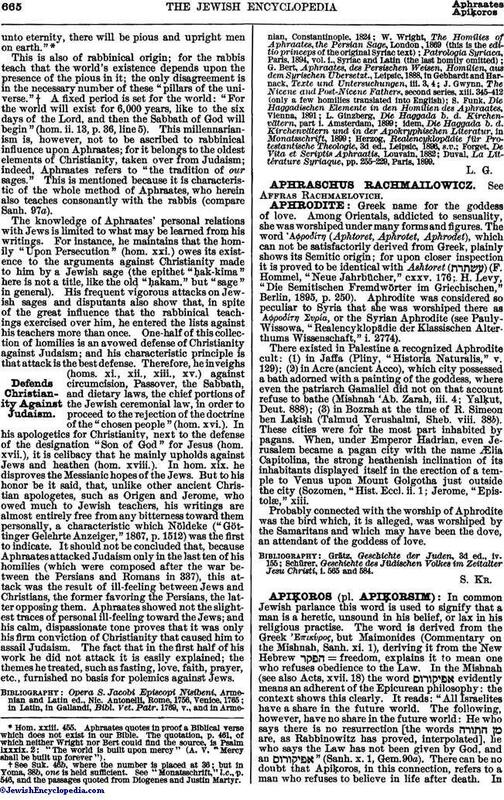 But to his honor be it said, that, unlike other ancient Christian apologetes, such as Origen and Jerome, who owed much to Jewish teachers, his writings are almost entirely free from any bitterness toward them personally, a characteristic which Nöldeke ("Göttinger Gelehrte Anzeiger," 1867, p. 1512) was the first to indicate. 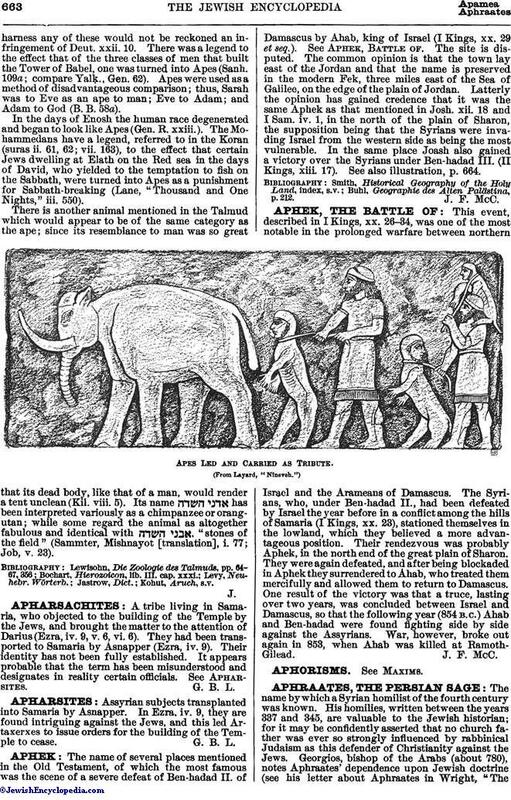 It should not be concluded that, because Aphraates attacked Judaism only in the last ten of his homilies (which were composed after the war between the Persians and Romans in 337), this attack was the result of ill-feeling between Jews and Christians, the former favoring the Persians, the latter opposing them. Aphraates showed not the slightest traces of personal ill-feeling toward the Jews; and his calm, dispassionate tone proves that it was only his firm conviction of Christianity that caused him to assail Judaism. The fact that in the first half of his work he did not attack it is easily explained; the themes he treated, such as fasting, love, faith, prayer, etc., furnished no basis for polemics against Jews. Duval, La Littérature Syriaque, pp. 255-229, Paris, 1899.